Teaching, Research & International Policy (TRIP) Principal Investigator Mike Tierney and Project Manager Nicky Bell, '12, led a group of research assistants, Joana Zhu, Darice Xue ’15, Michael McCoy ’15, Luis Madrid ’15, and Matt Ribar ’17 at the recent International Studies Association (ISA) southern region conference held October 25-6 at the University of Richmond. 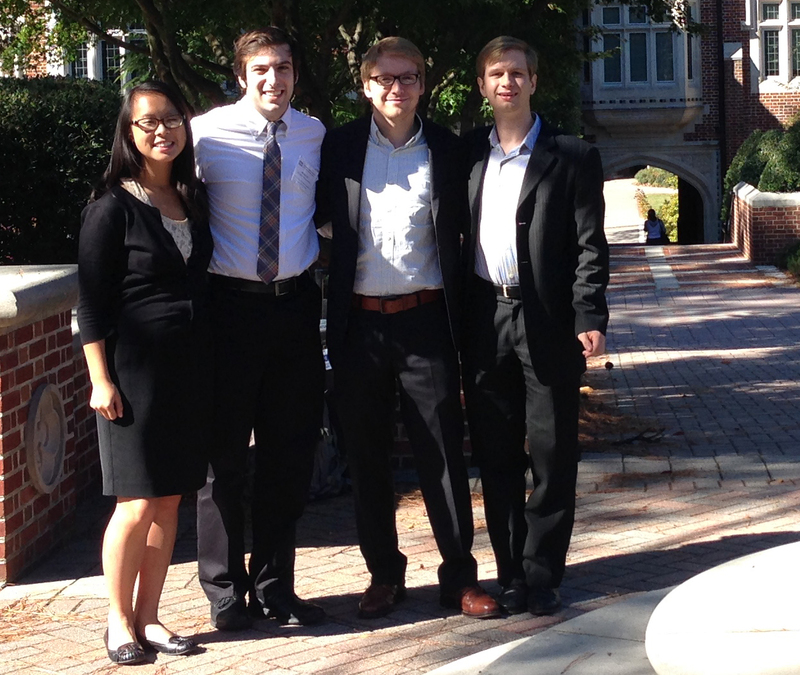 Pictured are: Nicky Bell, '12 (2nd from L) with Darice Xue ’15, Matt Ribar ’17, and Michael McCoy ’15. ISA convened scholars from across the U.S. to discuss approaches to “Bridging Theory and Practice: International Studies in the Twenty-First Century.” TRIP student Matt Ribar, ’17 had the opportunity to share his original research with participants during the conference. Ribar presented the results of his study of the way IR scholars respond to major world events in their research. According to Bell, “the quality of Matt’s research and presentation rivaled those of advanced graduate students.” Along with student research, Tierney presented the results of the latest TRIP Faculty Survey, and Bell presented a paper on undergraduate IR curricula in the United States. The students attended a variety of events showcasing recent scholarship on the divide between academics and policymakers. Expanding on the conference’s theme was the keynote address of ISA President Dr. Amitav Acharya, chair of the ASEAN Studies Center at American University. In it, he emphasized the importance of approaching international studies with a truly global outlook, including non-Western ideas and contexts. This focus is quite familiar to TRIP researchers, particularly in its Global Pathways project. The International Studies Association (ISA) has been the premier organization for connecting scholars and practitioners in fields of international studies since its founding in 1959 to promote research and education in international affairs. With more than six thousand members in North America and around the world, ISA cooperates with 57 international studies organizations in 30 countries, is a member of the International Social Science Council, and enjoys nongovernmental consultative status with the United Nations. TRIP survey data has been featured in numerous editions of the ISA periodical of scholarly research, the International Studies Quarterly. TRIP is based at the Institute for the Theory & Practice of International Relations (ITPIR) at William & Mary. Tierney also serves as ITPIR Director. For more information on TRIP’s research and student opportunities, visit here.